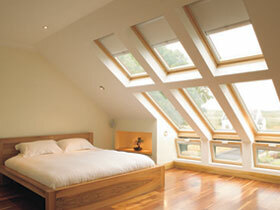 Welcome to G&A VELUX Roof Window and Skylight Specialists of Surbiton and Thames Ditton. We are a professional roofing and window fitting firm that delivers quality roof windows at competitive prices for homes and businesses across Surbiton and Thames Ditton. G&A is a reputable company that is recognised as a VELUX specialist. We are a 5-star VELUX installer, which means that our qualified roofers are fully trained in VELUX products and are equipped to offer professional advice to customers wanting roof lights installed in their property. We offer a vast selection of VELUX products, including the VELUX CABRIO balcony and VELUX sun tunnels, which are specially made to bring light into dark areas with flat roofs such as hallways and bathrooms. At G&A Surbiton and Thames Ditton, we aim to bring our customers the best prices possible on VELUX roof windows and skylights and we can often install windows without the need for scaffolding, so our service is cost-effective as well as convenient. We also provide roof window repairs to deal with leaking roof lights. G&A has been established for over 25 years. We have gained a reputation for providing excellent customer care and superior workmanship. We are committed to providing a first-rate service to our customers in Surbiton and Thames Ditton and before starting any work, we will always undertake a risk assessment on your property. We can also offer other services such as roofing and general home maintenance. We can install VELUX roof windows and skylights in your loft conversion, transforming it into a relaxing space that’s filled with light and well ventilated. VELUX is a popular choice for homeowners wanting practical, stylish windows to complete their renovations. We would be happy to discuss all aspects of your loft conversion with you. Call G&A VELUX Roof Windows and Skylights Surbiton and Thames Ditton today on 020 7205 5785.